We offer you our unique range of Label Rouge farmer’s rabbit ! We have gained joint partner loyalty through our common commitments, namely the welfare of the animals and a high quality meat industry. The product specifications for our “Paille d’Oree Label Rouge” Farmer’s Rabbit is rigorous. The breeders don’t simply adhere to the required standard: They love their craft that requires innate skill, and daily care and attention to their stock. Our breeders play a major role in the welfare of the animals in their care, from their first day they are born. 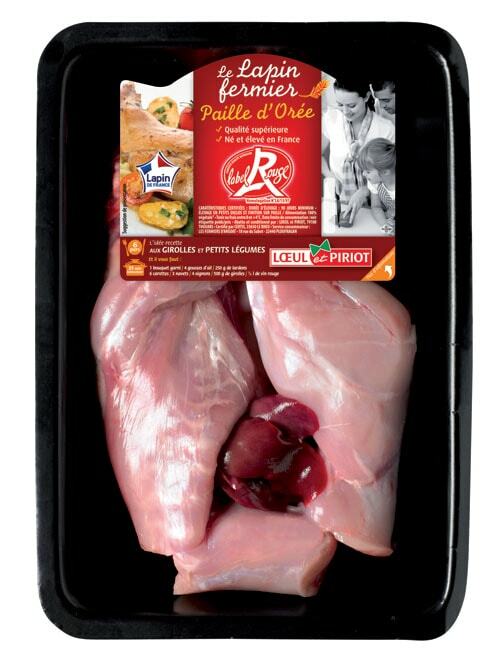 It is with this patience and passion that farm bred rabbits “Paille d’Orée Label Rouge” are reared on family farms, as they proudly commit to produce this high quality product. Label Rouge is a unique hallmark that guarantees a superior quality over products of a similar nature. To bear the Label Rouge mark, foodstuffs must be agricultural products that are unprocessed. 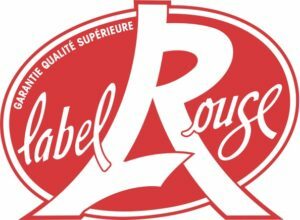 Label Rouge certifies that the foods and products bear specific characteristics that establish it (or them) as being of a higher standard, most notably arising from their particular methods of production or fabrication, that conform to a set specification, that distinguishes them from similar products that are also available for consumption. ORIGIN : A specific breed selected for the quality of its meat. The Label Rouge product specification is unified with the rights of the French public: (INAO -Institut National de l’Origine et de la Qualité). A certificated body recognised by the State audited by strict codes of practice with checkpoints throughout the production process. Traceability of breeding at the point of sale. The breeder’s name and contact details are visible on the information label on each product, along with the weight and price. In addition to this, a particular identification reference number is also written on the label, enabling the purchaser to trace the life of the rabbit. It’s all about proper identification. Details appear on the label of the type of breeding and rearing for the animal, along with the body that certifies the product . Each year, blind tastings are conducted by accredited laboratories in order to test the superior taste quality of Label Rouge products. – A panel of experts involved in buying both Label Rouge and comparable products. Because of the specific breed, the age, a feed rich in cereals and careful breeding, the nutritional quality of the Label Rouge Farmer’s Rabbits are different. They contain less lipids and therefore less fats..